knowledge gained from the discussions. Analyzing Texts: "Text Talk Time"
What routines does Ms. Brewer have in place to help discussion run smoothly? Notice the questions Ms. Brewer asks her class. What makes these questions rich? Why is it beneficial to engage students in both small and large group discussions before writing? I really like the way students ask questions, and then they to turn to a partner and discuss what they read using " small text, talk, time". It was great to see students participate while utilizing listening strategies and specific group rules during "text, talk, time". I like this idea it's like a socratic seminar, it makes sure the students were listening during the class. There's another idea: the students can't repeat what any of the previous student had said. This is a great way for students to be engaged with one another and to see which students completed the readings. This is good for those who are reluctant to participate in class. 02:02:50 STACY BREWER: And that’s okay every once in a while that happens in normal conversation, but we just remember that if I call for the zero noise signal that we’re all going to come back as a group and hear one person. Listen carefully to the speaker, right? 02:03:18 STACY BREWER: I use the strategy of hand signals in order to promote active listening. I also use hand signals to help me facilitate the conversation. 02:03:26 STACY BREWER: Oh, wow, lots of thinking. 02:03:40 VANESHA: I have two questions. 02:03:43 STACY BREWER: Pose them to the group. 02:03:45 VANESHA: Okay, so the first one is what happened to the ship after they left, the ship that was going to come and they waited? 02:04:06 STACY: Julio, show us up. 02:04:07 STACY: I’m just choosing students and I’m trying to give turns to an equal number of students from different parts of the circle. I’m the facilitator in this discussion. 02:04:17 STACY: Natalia, you have something to add? 02:04:45 STACY BREWER: I don’t think she was with them the whole time. Devonte? [sp] Do you see where there’s evidence? 02:05:06 STACY BREWER: And since I know that this is a narrative nonfiction and we’ve been learning about how in nonfiction the pictures and the captions, that gives us lots of information we could probably be pretty sure that Sacagawea was with them and that this picture is placed here to give us that information. 02:05:22 STACY BREWER: Next I give them questions that I expect them to write about once we’re done with text talk time. How does the author feel about Lewis and Clark? 02:05:43 STACY BREWER: So will you take a minute and turn and talk to the person sitting next to you about what you’re thinking about this question? 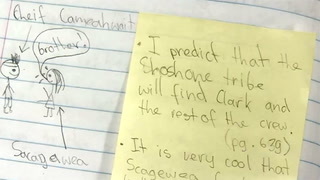 What do you think the author, how do you think the author feels about Lewis and Clark? 02:06:14 ALYSSA: It says on page 644, from St. Louis Lewis and Clark traveled to Washington, DC and almost every time they passed through they brought bands to welcome them as heroes, which meant that like whenever they came in and everyone’s like cheering. 02:06:28 ALYSSA: And like congratulate them so like the author like put that in to make everybody feel that they are heroes. 02:06:37 STACY BREWER: Okay, so you would say that the author, the author feels like Lewis and Clark were heroes. 02:06:41 The next question was, what is the author’s viewpoint about exploring and I provided them with the sentence frame to start their answer. The author thinks exploring is. The author thinks exploring is. 02:06:58 BOY: I think it’s exciting. 02:07:01 BOY: Because you could find out new stuff about different things you never knew about. 02:07:23 BOY: Especially in those times, it’s North America wasn’t North America yet it was just, it was called the New World. Yeah so it was, it was pretty interesting to them because they found new plants, new animals, new stuff they could use. 02:07:39 STACY BREWER: And on 641 I noticed that he said I found a descriptive word; they emerged from the Rocky Mountains into the lovely valley of clear water river. If an author’s using an opinion word like lovely that’s sort of showing how they feel about something. 02:07:55 STACY BREWER: So I’m thinking that I, it’s time to change gears. We need to get up and go back to our desks and start getting our minds ready for writing. 02:08:04 STACY BREWER: In today’s discussion I posed the question about how the author feels about exploring. How the author feels about Lewis and Clark. With the expectation that the students were going to pull evidence from the text just to support those statements. 02:08:16 STACY BREWER: That’s challenging work and I knew that it would, it would be pretty challenging for the students to work on individually in writing. So doing all that difficult thinking together in a group while they had support and they could hear other ideas is helpful for them. 02:08:29 STACY BREWER: And I think it makes it easier for them to write about it individually later.